Selling and buying homesteading, survival, and off grid retreat land become a robust and growing niche in the real estate industry. It is not difficult to find quality parcels of land in rural areas, a few clicks on your keyboard will surely lead you to copious amount of large acre listings. But, when searching land for sale websites and dealing with conventional real estate agents, you could wind up with a piece of land that is neither sustainable nor defensible. Real estate land specialists generally have advanced knowledge of farm land needs, but that type of input is not going to take preppers far enough when searching for a property that fits their survival retreat needs and desires. In fact, a so-called land specialist might just be the guy or gal at a particular real estate brokerage that doesn’t mind putting on a pair of boots and hiking rugged terrain in hopes of a sale. If you expect a conventional land specialist to be able to tell you whether or not the wind generated on a piece of property will be able to support a 1,000 square foot off-grid homestead, prepare to be disappointed or worse yet, completely misled. Survival real estate agents and brokerages, whether online or at a brick-and-mortar office, are just like you. They think like you. They act like you. They won’t think you are nuts when you start describing your particular property needs and wants…and they know exactly what you need in a piece of land, even if you are not exactly sure, yourself. My training as a licensed real estate agent and the fact my husband owns a real estate appraisal business, coupled with our preparedness knowledge, allowed us to discover our dream 56-acre survival homestead – but it took us two years of searching to find it! They’re are not any survival real estate agents in our region, we were on our own in our search, review, and comparison of potential properties. Thankfully, there are now a growing number of websites that not only list survival, homesteading, and off grid properties exclusively and around the country, they also review and share links to current listings from conventional property for sale websites that meet their stringent preparedness criteria. Some of the websites, like the brokerage at the top of my list, Black Rifle Real Estate, even connect you with like-minded real estate agents (that they carefully screen) in your respective area. “Ready. Aim. Move” reads the logo on this very patriotic and staunchly pro-Second Amendment website. If you do no cherish and respect the Constitution, you definitely will not be invited to be a part of the Black Rifle real estate professionals family! 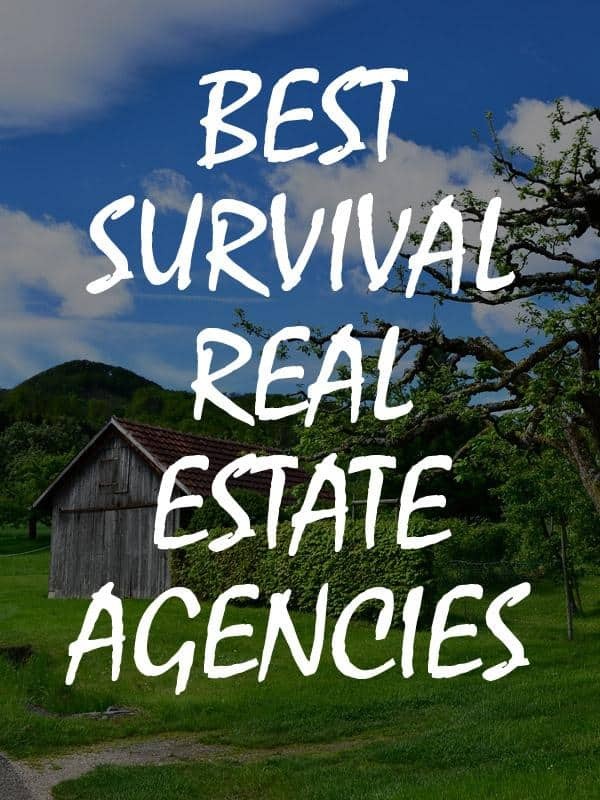 Oddly enough, the top survival real estate brokerage I chose for this list is not exclusively a seller of homesteads or off grid and prepper retreats – yet they were still a standout above all the rest. I chose the Black Rifle Real Estate Company for the top spot for several reasons, chief among them being that you will feel fully embraced and accepted when you contact them to either sell or buy a property…and know your commission money will never, ever, fall into the hands of a liberal voters who supports even a candidate or piece of legislation that will in any way, impede upon your absolute right to protect and prepare your family for a SHTF scenario. The founder of the company, Todd Savage, was a United States Marine who got more than his feel of socialism and liberals when he returned to his family in California after a tour of duty moved to northern Idaho. After working alongside a wide range of real estate agents and brokers, again encountering more liberals that he liked, he started opened Black Rifle and began referring both buyers and sellers to bonafide patriots nation wide, and urging other veterans to join him. ALL of the Black Rifle Real Estate Company’s nationwide circle of real estate agents are gun owner. In fact, many of the agents are firearms instructors, cowboy action shooters, gunsmiths, Class 3 weapons owners, and of course, have a concealed carry permit. The second primary reason I firmly chose Black Rifle Real Estate Company for the number one spot on this list is because they sell properties both large and small in all types of communities. Many, if not most, survival real estate brokerages have minimum acreage requirements and sell only rural parcels of land. My primary tip for anyone attempting to set up a bug in location or homestead in the suburbs or an urban area is to MOVE to a rural area. But unfortunately, not everyone can do that, is physically able to do what it takes to move, or simply can’t afford to relocate right now. Those folks need and deserve access to survival and liberty-minded real estate professionals as well. If you cannot leave the suburbs or small town because of the medical demands of a loved one, fiscal constraints, or until you find a way to make a living in a rural location, a prepper or patriot real estate agent can help you find a neighborhood, home, and backyard that will best suit your immediate needs security, liberty, and sustainable needs. In an excellent report written by Savage for American Redoubt, the Black Rifle owner summed up what makes a “property worth defending” perfectly. He said it had to possess abundant water year around, sustainable food production, and alternative energy. Black Rifle Real Estate Company is not a security consulting business, but imagine the benefits of having a veteran tour properties, both rural and suburban, as you attempt to determine how defensible it will be against the marauding hordes and ponder how the terrain around the home site could deter surveillance and access by potential attackers on foot. This Black Mountain real estate brokerage is operated by a homestead, strategic, and off grid specialist. Retreat Realty lists properties in the western North Carolina region. There a larger and quality nationwide, even worldwide, survival real estate agencies we will get to on this list, but Retreat Realty’s location in the heart of prepper central, earned it the number two spot. Move over Idaho, Black Mountain just might be the new prepper mecca! The region is emerging as a magnet area for preppers due to its abundance of natural resources, like-minded communities, as well as quality and affordably priced land that thanks to the mountainous region, in most cases are also highly defensible properties. This Asheville, North Carolina is survival real estate company is located just a few miles away from the small town of Saluda, where the only hands-on 3-day preparedness training “expo” takes place each year in September, Prepper Camp. The big daddy of the prepping movement, Dr. William R. Forstchen, the author of One Second After, also lives in the region and has been the keynote speaker at Prepper Camp multiple times – spending an enormous amount of time chatting with the attendees and almost instantly making them feel like old friends. “There are a lot more of us than most people would think, and especially here in the Black Mountain area, with it being the setting for Bill Forstchen’s book One Second After and his two follow up books, and its sometimes surreal to drive past locations he describes in the books and to personally know many of the characters in the books.” Retreat Realty broker, John Haynes, told Survival Sullivan. “As a result, this area is somewhat ‘on the map”’ for preppers. Like many preppers and genuinely kind folks in the area, Haynes counts Forstchen as a friend. I did not know this when I chose Retreat Realty for a spot on this list. But, if you are looking to relocate to an area filled with fellow preppers, could you really think of a better real estate professional to help you find your land than someone who both knows and appreciates Forstchen and his work? I highly doubt it. 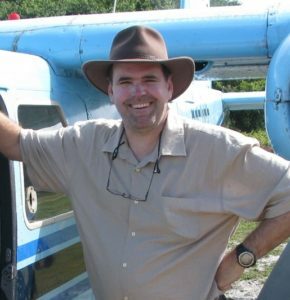 Submitted photo of Retreat Realty broker John Haynes, taken during a trip to Guyana. My preparedness mentor, survivalist gardener Rick Austin, keeps telling me all the “cool kids” live in the Black Mountain area. After visiting the area for the first Prepper Camp, I had to agree, at least the biggest group of cool prepper “kids” live there. If I ever left our beautiful spot in Appalachia, which will soon be on the prepper map thanks to a billionaire building an exclusive prepper compound in the region, the Asheville area is definitely where I would take my family to ride out the apocalypse. Retreat Reality is located near the Carolina Readiness Supply store in Waynesville. It is arguably the biggest and best stocked survival brick-and-mortar and mortar store in the country. The owners of the store, Dan and Jan Sterrat, also play host to the Heritage Life Skills each year – where Haynes is an exhibitor. Like Prepper Camp, Heritage Life Skills offers about 40 classes on homesteading, preparedness, and survival topics like blacksmithing, solar ovens, first aid, knife skills, and the identification of edible plants, but engages in more of a classroom setting than Prepper Camp, which is held in large event tents and the outdoor areas of the Orchard Lake Campground. Purchasing a survival homestead from the Retreat Realty property listings could make you a prime candidate to join the 5,000 or so other preppers in the region who belong to the Carolina Prepper’s Network – or CPN. Haynes’ survival real estate brokerage is one of the five corporate sponsors of the prepper network that was created by Forest Garvin. CPN members reside in several towns throughout both North and South Carolina. Haynes also told Survival Sullivan one of the best tools accessible to preppers in the CPN is the group-wide text warning system that alerts everyone to emergencies immediately. “One of the best tools CPN has is an alert system that goes out to every member via text in the event of a major incident. An example was the Colonial Pipeline explosion last year that disrupted fuel deliveries to the east coast. We all got rapid notification and were able to top off our tanks before most people had heard about it,” the survival real estate broker added. John Haynes began working in the property sales field in 1987 as a real estate appraiser. He was recruited by not one but two Fortune 500 companies to work in their land development groups. Retreat Realty has sold properties as small as three acres up to 253 acres in a wide array of price ranges. Some of Haynes’ customers were on a very tight budget with little money to put down on the parcel, but others have far deeper pockets, like a billionaire hedge fund founder. The 30 plus years in the real estate field, coupled with the prepper-rich region around Black Mountain, enables Retreat Realty to find top quality land for survival, off grid, or homesteading purposes that will help clients prepared for both man-made and natural disasters. This just might be the first and still one of the largest and strongest, survival real estate services in the United States. Survival Realty is based out of Idaho. Unlike Black Rifle and Retreat Realty, Survival Realty is not operated by real estate professionals and does not actively engage in the listing or selling process. Survival Realty is a prepper retreat advertising service – and a really great one. The website has at about 25,000 views per month, on average. The properties are offered for sale by either a professional real estate agent of the owners themselves. While many of the properties are typically located in Idaho or the surrounding states, there are ample top quality potential survival retreat sites from around the country advertised on the website. I even found one from my neck of the wood during a recent search. All of the properties listed for sale on Survival Realty must meet the strict prepper retreat guidelines outlined on Survival Realty. • The listing must be at least five acres, unless is is adjoins public land, is accessible by 4-wheel drive, a plane, or a boat, or is located in a very isolated or off grid community. • The property cannot be located next to a major highway. • The listing also cannot be located adjacent to a major population center. • It must possess either a septic system or “good potential” for a septic system. • In cold climates, the home must also have an independent heating system, like a propane tank, gas furnace, or wood heat. • The property listing has to have an independent water source: a well, good potential for a well, spring, or some other type of water on the land, like a creek or pond. • Property listing rule exceptions may also exist for home that have high security and construction systems, secure storage, safe rooms, be completely energy efficient, have built-in vaults, and living space for multiple or extended families. • The exceptions to the listing guidelines also state ranches and farms that have self-sustaining livestock operations, extensive greenhouses and gardens, and permaculture, aquaculture, or hydroponic facilities, could also possibly be included on the website. Ultimately, the operators at Survival Realty make the call about whether or not the proposed off the grid, homesteading, or prepper retreat property meets their stated standards and will be posted to the website. These two incredible survival land wonderfully intertwined and provide beginning to end – and beyond, prepper retreat search and establishment services. American Redoubt Realty and Survival Retreat Consulting creates relationships with trustworthy real estate professionals in the region and also in “Micro-Redoubt Safe Havens” around the country. The SRC homepage slogan, “The Freedom of Rural America is Awaiting,” sums up the mindset of the real estate business perfectly. The American Redoubt movement was initiated by survival author James Wesley Rawles in one of his many best-selling books, in 2011. Rawles designated three states as a safe haven for freedom-loving conservatives and libertarian-leaning Christians and Jewish people – Idaho, Montana, and Wyoming. He also include parts of bordering states, the eastern portions of Washington and Oregon, in the figurative boundaries of the American Redoubt. Rawles carefully selected these area because of their lack of prospective natural hazards and their respective low population density. While Rawles is not connected in any official or business capacity to either American Redoubt Realty or Survival Retreat Consulting company, he did play are role in their creation. Actually, it is number 1 and number on our list that ended up being very closely linked! Todd Savage and his wife, Audra, operate this incredible survival real estate business as well. During their struggle to leave urban living behind in 2003, the couple met Rawles and received some sage advice to guide them along in their retreat search, and it changed their lives forever. It took Todd and Audra Savage three years and more than 30 visits to the American Redoubt region created by Rawles in his books to find the perfect sustainable survival property. Savage recalled the real estate search journey as being full of frustrations and stress. The couple simply could not find a real estate agent could provide the type of discretion, consultation, or professional services they required. No real estate professionals they encountered were willing to pre-visit, evaluate, or screen the potential survival retreat properties they were finding online. The real estate agents didn’t seem to take the time to try to understand the dreams and goals of the couple, or bother get to know them. Instead, the Savages’ we instructed to simply drive around and check out the properties themselves and give the agents a call if they saw something they liked and wanted to write an offer. The horrible experience trying to find both the right real estate agent and the right land, eventually led to the creation of one of the most respected survival realty agencies in America. The company offers strategic relocation and retreat consulting services, confidential and discreet real estate brokerage services, property analysis, “Tacticalscape” landscaping services, secure architecture and design services, and privacy consulting. American Redoubt Realty, Incorporated has now generated relationships with some of the most knowledgeable prepper land listing professionals around the country. When you sign up to become a client of the agency, you spend about 30 minutes engaging in a private interview with the consultation team. The team helps guide you on your strategic relocation search for rural property and help refine your selection criteria. You can then sign a buyer representation referral agreement with the agency, and provide typical loan approval documents or other proof of financial worthiness. Next, you are referred to one of the agency’s affiliated prepper real estate agents in either the American Redoubt or one of the Micro-Redoubt Safe Haven regions. You can also list your property for sale with American Redoubt Realty. The land must meet a set of outlined criteria to be accepted for listing. You will then be connected with an affiliated broker in your area and have the parcel advertised on survival property websites. For OPSEC reasons, many preppers are extremely hesitant about revealing personal information to strangers, that is understandable. While you could opt to use #3 on this list exclusively to find your survival retreat, I believe you would be doing yourself, and your loved ones, a disservice. Searching online via a great website like Survival Realty is a great idea, it lets you see what is out there, compare attributes and price, and thoroughly research the communities around each area. But, the learning stops there, especially if you are relocating out-of-state, or even to another region of your state. How many trips can you realistically make to tour the homes on your narrowed down list comprised after an online search? The time and money spent checking out properties can skyrocket rather quickly. When I was still working professionally in the real estate field, I did the legwork for out-of-state clients, sometimes it resulted in a commission, sometimes it did not. This is a factoid you should think about…hard. I was raised to have a solid work ethic and took pride in my work. Not everyone is so diligent, especially if the client is someone they might never have to meet face-to-face. I hiked the land and took photos and videos from every conceivable spot, I searched for places that seemed likely spots to put in a well or a pond, I took soil samples and gave them to our Soil, Water, and Conservation office for free testing to check the quality, the same with water samples if there was an existing pond on the property or a creek running through it. I knew homesteading and horses, so I could tell the difference between quality pasture and strip-mined junk land. I asked some pilot buddies to snap some aerial shots of the property during their weekly excursions so the potential buyer wouldn’t have to rely on Google Earth to get a true picture of their prospective land. Can you expect this level of diligence and expertise from real estate agent? Let me answer that one for you…heck no! I have worked on property deals with some fabulous and honest to a fault real estate agents and appraisers, and with those who should have had their licenses yanked a long time ago. Expecting every agent to understand your needs, both the known and spoken ones and the important aspects of creating a survival homestead, off grid or not, that you may not have pondered enough, or at all, is a recipe for disaster – even before the SHTF. So, in my humble opinion, as a former practicing agent, a prepper, and the owner of a sustainable 56-acre retreat, start with an online property search and then trade what will amount to just a smidgen of personal information, with a preparedness real estate professional to ensure you have done everything humanly possible to help your family survive the apocalypse. Once you have decided to fully engage the services of a prepper property expert, start thinking beyond merely surviving, but thriving during the reconstruction of society. This is perhaps where the services of Retreat Realty and American Redoubt/SRC will be the most valuable. Working with a company and agents that are immersed not only in the survival community, but in the literal community where the property is located. These communities are prepper-oriented, accepting, or otherwise self-reliant areas. Odds are unbelievably strong that you would be living among people who largely hold the same beliefs, goals, and love of the Constitution and liberty. Traditional real estate agents, in many states, are barred from giving you details about the neighborhood, schools, if a toxic dump is soon to be erected in the county, etc. because doing so could get them in trouble of alleged bias violations with their respective state commissions. Providing resources for survival relocation, survival retreats for sale in the United States and Worldwide, and independent preparedness-focused real estate agents. I’d like to second the kudos given to John Haynes at Retreat Realty. My husband and I worked with John remotely for months before setting up a visit to check out properties. His ability to distill what we were looking for and his hard work and dedication led us to finding our soon-to-be homestead in short order. His post-offer negotiating/communication skills are fabulous. Melissa, John seems like a really great guy who is very good at his job. I really enjoyed virtually meeting him. Only an hour, maybe, after this survival real estate article was published, I had a message from a friend in WNC asking how to get in touch with him to list a property. We finally found a …realist, prepper, survivalist in John Haynes and some one who has went to the front of his real estate class. He has done his home work……..We are presently awaiting the arrival of our buyer after just listing with Realty Realty. Chuckstur, Wow, it sounds like you had a great experience with one of the top survival real estate brokerages on our list. I hope you get to close on your deal soon! Do you list properties in Canada that are off the grid? I have one that is amazing that is for sale.